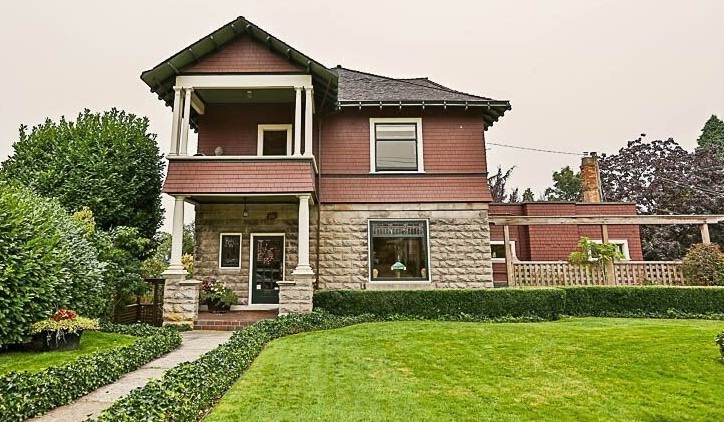 Style elements: Queen Ave Revival with a nod to Arts and Crafts. Architectural significance: This stately home’s unique style combines Queen Anne Revival elements like turned posts, a square layout, side-projecting gables with both upper and lower side porches, with the burgeoning Arts and Crafts era to come, as evidenced by the residences at 212 and 216 Queen’s Avenue, built almost five years later. 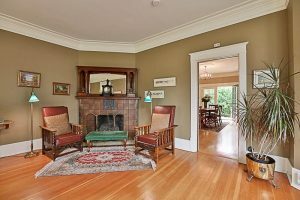 What to look for: Large principal rooms; an updated kitchen; and a fireplace mantle with lovely original tiles. First homeowners: Welcome to the home of Wesley Edgar and Jane Vanstone (nee Swalwell). The Vanstones and their three children: Lillian Alice, Charles Foster and Russell lived down the street near the corner of Third Street on Queens Ave. Later Wesley’s name would show up as living at 407 Queens in 1906. If you stroll down Queen’s Ave. you can see examples of early 1890s architecture at 319 and 321 Queens Ave.
Wesley owned W.E. Vanstone Plumbing and Gas Fitting and was considered the city’s leading plumbing service. By all accounts, Vanstone was noted a noted athlete and community leader, serving as city councillor for three years. Vanstone passed away in 1909 (at his brother’s house in Manitoba on Christmas Day) and was not able to fully enjoy his beloved house. The Vanstone sons, Charles Foster and Russell, both enlisted and served in WWI. Their Uncle Charles Vanstone signed their attestation papers. While brother Charles survived, Russell died in 1919 after contracting TB. He is listed on page 544 of the Book of Remembrance that honours the war dead. Russell is buried at the North Battleford Cemetery in Saskatchewan. 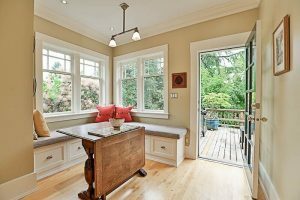 The current owners spent nearly 30 years restoring the house with affection and admiration for Vanstone’s vision of a grand family home. 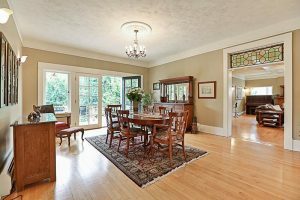 Still spacious and elegant, the updated home features a bright eat-in kitchen leading to a large dining room, and a family room addition built in 1926 that houses the billiards table. The fireplace has a beautifully crafted tiled mantle. 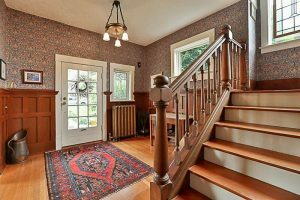 Only the first floor of Vanstone House is on this year’s Homes Tour. Expedia cruiseshipcenters – a retail travel agency franchise and global leader in the marketing and sales of cruise vacations. We also offer full-service travel booking for flights, hotels, land tours and resort packages. You’ve made your house a home – now it’s time for a holiday. Call Catherine and her fellow vacation consultants at 604-540-8896 or visit our uptown New West office at 628 Sixth Street. This entry was posted on Thursday, May 17th, 2018 at 11:51 am and is filed under Uncategorized. You can follow any responses to this entry through the RSS 2.0 feed. Both comments and pings are currently closed.